IRVINE, CA, SEPTEMBER 1, 2016 — The Irvine office of Land Advisors Organization, a premier nationwide land brokerage firm, announced today the successful closing of Alberhill Ranch 82 Lots within the Alberhill Ranch Master Planned Community. Alberhill Ranch 82 Lots is located west of Interstate 15 at the southeast corner of Lake Street and Alberhill Ranch Road in the City of Lake Elsinore, Riverside County, California. Land Advisors Organization brokers R. Jeffrey Spindler, F. Brian Carricaburu, Ian T. Sinderhoff, and Andrew Sinderhoff negotiated the transaction, representing the buyer and seller. The lots were sold by Castle and Cooke Alberhill Home Building, Inc. and was purchased by KB Home. KB Home is looking to continue the success of its two previous projects within the Alberhill Ranch Community, Terraces I and Terraces II. Alberhill Ranch is a 1,853-acre development with approximately 3,705 residential units and over 600 acres dedicated to open space with walking trails, parks, and schools. “Affordability has been a primary concern for the public homebuilders in the Inland Empire over the last couple of years. KB Home has been very successful in Lake Elsinore with their Terraces community in Alberhill Ranch. These home sites with excellent views of the lake and surrounding hillsides and generous 6,000 square foot pads will allow them to continue that success. Alberhill Ranch is a premier master-planned community sitting atop the hills north of the lake with an existing pool and recreation center, proposed commercial, and planned elementary school,” said Brian Carricaburu, Founding Principal at Land Advisors Organization. July 5, 2016 (Pasadena, California) – The Los Angeles Infill Team of Land Advisors Organization, the nation’s largest real estate brokerage firm focused exclusively on land, is pleased to announce the successful closing of Garvey Square, a 102-unit townhome community in the San Gabriel Valley. The property is located on the northeast corner of Garvey Avenue and Peck Road in El Monte, California. Land Advisors Organization represented LaTerra Development, LLC, a privately owned real estate investment and development company, in the sale of Garvey Square to TRI Pointe Homes, one of the largest public home builders on the West Coast. This townhome community will consist of homes ranging between 1,126 and 1,821 square feet. The project also benefits from over 32,000 square feet of common area open space for the enjoyment of future residents. “As one of the last few infill development sites in this part of San Gabriel Valley, Garvey Square will be a remarkable place for residents seeking to live within close proximity to the economically and culturally vibrant cities of Pasadena, Arcadia, and Downtown Los Angeles. Residents will enjoy access to the best restaurants, shops, employment, and entertainment centers the San Gabriel Valley and Los Angeles have to offer” says Richard Byrd, Senior Vice President at Land Advisors Organization. For more information about Garvey Square, please contact Richard Byrd x13, Tim Barden x11, or Chris Gomez-Ortigoza x14 at (626)376-9840. 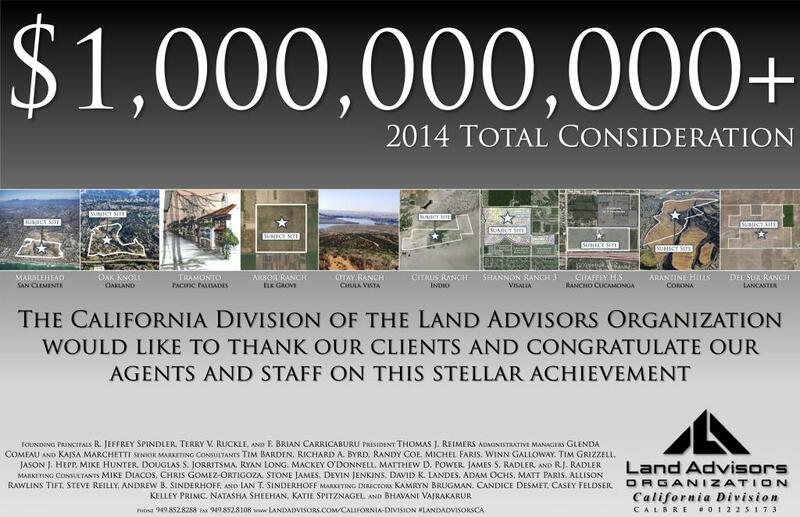 For more information about Land Advisors Organization, please visit us at www.landadvisors.com. The Land Advisors Organization specializes in the innovative brokerage of land and improved property through deep market insight and unparalleled service to owners and consumers of real estate. With an exclusive focus on land-related assets, we integrate comprehensive information, cutting-edge mapping technology and the knowledge and experience of highly specialized professionals to help our clients identify and capitalize on valuable opportunities in all kinds of economic environments. The Land Advisors Organization employs a true collaborative brokerage model with offices located in Arizona, California, Idaho, Nevada, New Mexico, Florida, Texas, Utah, and Washington. Join us in welcoming David Kidder as managing director, joining Steve Sims and Adam Deermount as part of our corporate expansion. The Arantine Hills master-planned project in the City of Corona continues to move closer to reality. The project went under contract with The New Home Company in the 4th quarter of 2013 and is expected to close in December of this year. The New Home Company entered a joint venture with Tricon Capital Group, a Canadian real estate investment company, to provide acquisition financing and develop the community. They intend to re-plan and re-entitle the 276-acre project to include 1,300 homes, parks, and open space. They expect to break ground in 2016 to begin selling lots and new homes. LAO is looking forward to a successful consummation of the transaction with The New Home Company and are very pleased in their efforts to develop this exciting new community in Corona.